Radiofrequency treatment of BPH is commonly referred to as TUNA—transurethral needle ablation of the prostate. This technique involves placing interstitial radiofrequency needles through the urethra into the lateral prostatic lobes to cause coagulation necrosis. The tissue is heated to 110°C at a radiofrequency power of 490 KHz for 4 minutes per lesion. The number of times the needles are placed into the prostatic lobes is at the discretion of the urologist based on the size of the prostate gland. The TUNA device and generator are shown in Figures 26 and 27. Two needles that are at 60 degree angles to each other are deployed into the prostatic tissues by piercing the prostatic urethra. Each treatment with the needles treats prostate tissue about 1 cm in diameter. Figure 26 Precision™ Plus Hand Piece. 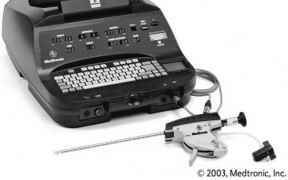 Courtesy of Medtronic, Inc. © Copyright 2003. Figure 27 Precision™ Plus System (computer and hand piece). 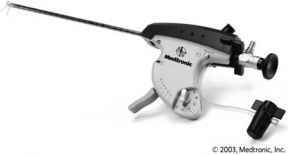 Couresty of Medtronic, Inc © Copyright 2003. Source: Loughlin, P. 100 Questions and Answers About Prostate Disease. Jones and Bartlett Publishers, LLC, 2007. TUNA of the prostate uses radiofrequency energy to treat the patient. As with most of the other MIST results, few long-term data are available, and thus, results must be viewed with caution. Table 14 contains combined TUNA results using both subjective and objective criteria.